Wood compliments of Frady Tree Care! Front posts are full logs. Walnut door came from Home Depot. I acquired this little house in Nov 2012. Demo’d inside down to stud walls in three days….ongoing lifelong project. Wow! I love it. Would love to see a shot from farther away. What an awesome entrance to a home…beautiful wood…Excellent jog. What a great facelift! 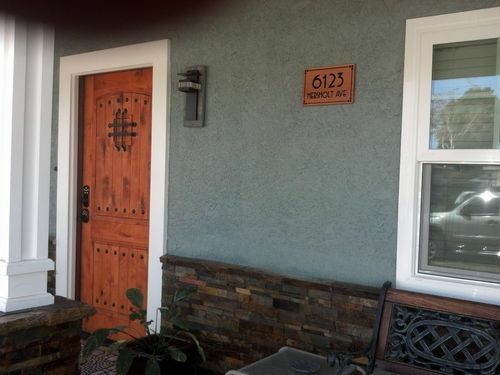 Love the wood and beams… You nailed it… Did you add the metal straps to the door? I have a door very close to this one as well is why I ask. Beautiful work. Be sure to keep us posted with other improvements. im in love, this is how i want to do my house when i build it, i just love me some cedar. and the plus side is, i get cedar for free, relatives live in a little town called, Cedar Creek Texas ! Wow what a difference from before , great job. What a fantastic transformation. Well done. Well done! I am looking forward to seeing what you do to the inside. I’m picturing a natural stone fireplace with copper accents?? Simply amazing. I would love to see pictures of the entire front of the house, before and after, to compare! I can tell that you’ll do amazing things in the future with your charming home! amazing work! I can’t show this to my wife or she’ll be begging me to do one too!